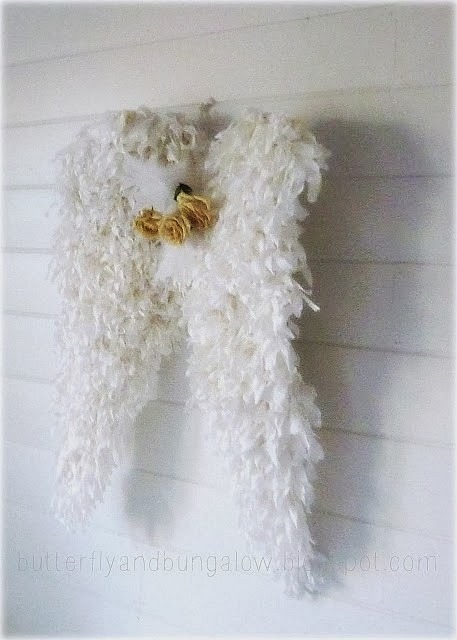 Angel wings for wall art in this room. 1. I cut chicken wire with flower snippers, because I could cut faster than with wire clippers. I kept losing my place, because chicken wire in hexagons is so repetitive. I cut two wings without a template from the chicken wire. I tried to copy the first one, but that didn't work because the wire rolls. I used one of the straight sides of the wire for one side of each wing. ( One can see in the photo below that one side is straight and the other side ends in hexagons.) I needed to have my husband place some pavers on the wire to straighten and hold the wire while I cut. 2. 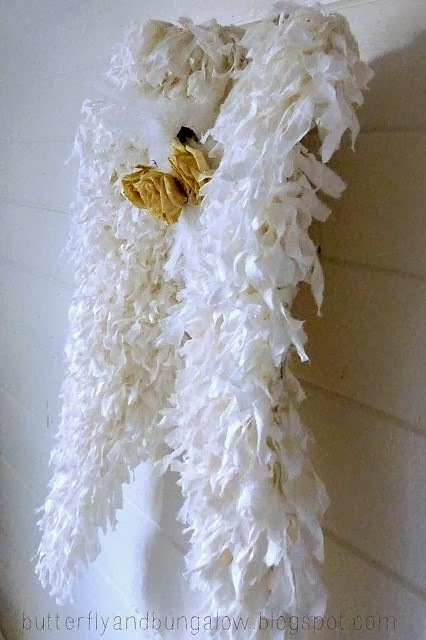 I cut an old comforter along its seams into material. I then began tearing the cloth into 19 inch pieces at or about 1/4 inch width. I made a big pile to start with. I made more piles as I went along. 3. I started at the bottom of the wing. 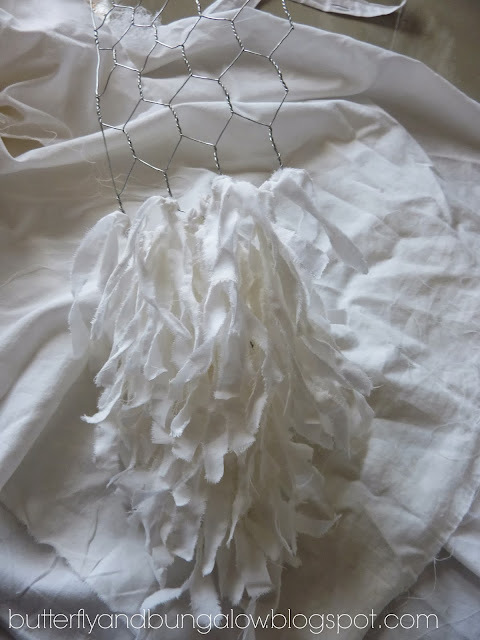 I folded each cloth strip in half and in half again which makes a loop on to the chicken wire or an un-secure knot, so then I knotted it again to secure. Two at the bottom of each hexagon and one at the intersection; in other words there are two rows of cloth in each hexagon. I just kept doing this row by row until I finished, though I did use slightly thinner strips near the top third of the wings for texture. 4. When the wings were completely covered I wove the two wings together with strips of cloth separating them by about six inches. I put a few feathers and dried flowers in the center. I put a loop on the back to hang them. Then while it was hanging on the wall, I shaped the wire a bit by bending it until I liked it. I then pulled out these really sharp sewing scissors and starting trimming the strips on the edges ever so slightly at an angle. The next time, I think I would make them slightly smaller, because it was time consuming; it took me a couple of days. I also might try a different shape. I still have enough material from the comforter to make another pair. Not too too tough, I think I'll make a multicoloured fairy version one day? With sheer fabric and ribbon? Love your gorgeous inspiration. Oh and you asked about the stone from the Bay of Fundy and I forgot to answer you! You can't see it too well in that picture but it's the non-crystally one in the picture with the big stones. It dark blue and very very soft and smooth from the tides. It's not any special crystal specimen, but it's just so perfectly smooth I think of it as magical, and my wishing stone! Jennifer, I think they would be beautiful multi-colored. I think the stone is magical; it's a magical place. Your angel wings are so precious. Thanks for sharing your process. You gave me some ideas for another project unrelated to angel wings. so cute!!! Lovely work too. Super cute idea and so sweet! Very creative! OMG!!! Love it! Thanks for the inspiration!! So...gorgeous! Truly, that is so lovely. I love angels! Thank you, Patty. I do too! I am glad that you showed us how your did it...they are so lovely and I'd wondered. Alot of work there but just gorgeous!! Thank you, Deb. Merry Christmas! Oh my. I love these. I may have to try this. Although I am already the chicken wire I cut wont look like wings. lol I can try! Have a Merry Christmas. Thanks for visiting me... I appreciate the comments. I truly LOVE these wings! Very unique, and oh so beautiful! Thank you so much for sharing them with us at Ivy and Elephants. Thank you so, so much for the tutorial. As soon as Christmas is over, I am making the angel wings for myself. Hope they turn out as beautiful as yours. Merry Christmas to you and yours. Pat. It might have been time consuming, but it was really worth it! Very beautiful! Well worth your time i think. The added flowers are gorgeous! Thanks for sharing with SYC. So sweet, I think you did a wonderful job! Love this! Did you cover each side of the wire? Thank You! I am trying to create this lovey art. It is so elegant and classy looking. These are so inspiring... What a sweet idea... and realitively simple..I think ( ha Ha) ...I'd love to try it !! !